Medications for humans can make cats ill. Doing what's best for your feline friend may mean leaving her in pain or feeling ill until a veterinarian can prescribe relief. You don't want to administer meds that have not been prescribed. This is because many medications that make humans feel better are poisonous to cats. Not only are medications intended for humans manufactured in much higher doses than a cat should receive, they also interact differently with a cat's body. Many common over-the-counter and prescription drugs cannot effectively be processed by a cat's kidneys, others raise blood pressure and cause heart problems. Although there are a few human medications that can be safely administered to cats, it's always best to assume that a drug is not safe for cats, unless your veterinarian says otherwise. Some medications cause more problems in cats than others, because they are either more dangerous or more commonly given to cats by their owners, or are tasty to felines. Acetaminophen, aspirin, ibuprofen and naproxen, all common over-the-counter pain relievers are highly toxic to cats. It is safer for the cat to experience some pain while waiting to see the veterinarian than to be given a human pain reliever. While most people don't purposely give their cats antidepressants or ADHD medications, cats seem to like the taste of some drugs and will eat them if given the chance. These drugs can cause dangerous seizures, rapid heart rate and elevated body temperatures. Other common human medications dangerous to cats include vitamin D derivatives, sleep aids, anti-diabetic drugs, cholesterol and blood pressure medications, and thyroid hormones. Besides avoiding purposely giving your cat human medications, it's important to keep your cat from consuming drugs intended for people. Store your medications in child-resistant containers in cupboards or drawers that cats can't open. Avoid leaving loose pills on the counter before you take them. Don't leave pills in plastic baggies, cups or other containers that a cat can easily access. It's just like a cat to refuse expensive food and then chew through a plastic to get to a pill it shouldn't eat. 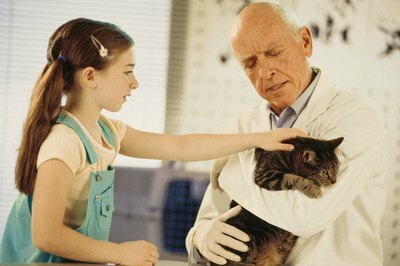 Always check with a veterinarian before giving any medications to a cat. The vet can provide dosage and frequency instructions as well as any warnings about possible side effects. Human medications that are safe for cats when given properly under a veterinarian's advice include Dramamine for motion sickness, mineral oil for constipation, hydrogen peroxide to induce vomiting, Kaopectate to relieve diarrhea and betadine to clean cuts and scrapes. Other household items that you can use topically on cats include corn starch or flour to stop bleeding from a nail, baking soda mixed into a paste for bee stings or ant bites, and saline solution to flush out wounds. Diphenhydramine, commonly sold under the brand name Benadryl, is safe for cats but is not very effective for allergic reactions. It is often used, however, for light sedation, such as calming a cat for travel in a car or preventing car sickness. Are Chives Poisonous to Cats? Is Apple Blossom Poisonous to Cats?